Now largely a secular festival, Mardi Gras originated as a Christian celebration. The season runs between the Feast of Epiphany and Ash Wednesday in the spring, culminating in the revelry of Mardi Gras (French for "Fat Tuesday"). 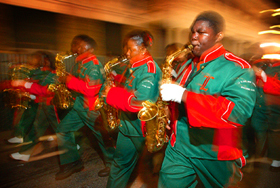 Mobile, Mobile County, was the first U.S. locale to celebrate the festival, beginning in the early eighteenth century, when it was still a French colony. Celebrations include balls and parades featuring elaborate floats and costumes created by the city's Mystic societies.